London, 1953, 1st UK edition. 300 pp, 48 plates. 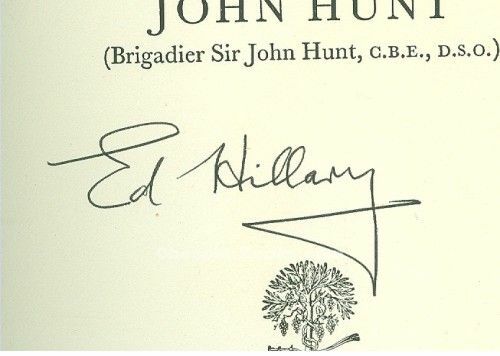 If you want to collect just one book signed by Ed Hillary, this is probably the one to have. The official account of the first ascent of Mount Everest; this is the first book written about the climb. Chapter 16 on the on final assault was written by Edmund Hillary. The book and dust jacket are in very nice condition, DJ, Near Fine - Fine. The book has no inscriptions, no serious flaws of any kind, the DJ may have minor edge wear (rubbing) but no tears or chips. 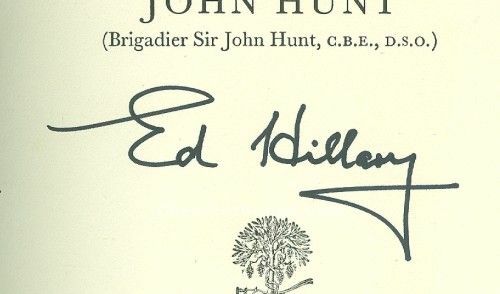 We personally obtained this signature in person in one of our several meetings with Edmund Hillary over the past thirty years. By conquering Everest, the beekeeper and the Sherpa affirmed the power of humble determination -- and won one for underdogs everywhere On May 29, 1953, Edmund Hillary of New Zealand and Tenzing Norgay of Nepal became the first human beings to conquer Mount Everest -- Chomolungma, to its people -- at 29,028 ft. the highest place on earth. By any rational standards, this was no big deal. Aircraft had long before flown over the summit, and within a few decades literally hundreds of other people from many nations would climb Everest too. And what is particularly remarkable, anyway, about getting to the top of a mountain? Geography was not furthered by the achievement, scientific progress was scarcely hastened, and nothing new was discovered. Yet the names of Hillary and Tenzing went instantly into all languages as the names of heroes, partly because they really were men of heroic mold but chiefly because they represented so compellingly the spirit of their time. The world of the early 1950s was still a little punch-drunk from World War II, which had ended less than a decade before. Everything was changing. Great old powers were falling, virile new ones were rising, and the huge, poor mass of Asia and Africa was stirring into self-awareness. Hillary and Tenzing went to the Himalayas under the auspices of the British Empire, then recognizably in terminal decline. The expedition was the British Everest Expedition, 1953, and it was led by Colonel John Hunt, the truest of true English gentlemen. It was proper to the historical moment that one of the two climbers immortalized by the event came from a remote former colony of the Crown and the other from a nation that had long served as a buffer state of the imperial Raj. John Hunt was born in India, and educated at Marlborough College and at Sandhurst. After a distinguished military career in India and Europe, he led the first successful expedition to climb Mount Everest and was knighted. He also led the British party in the British-Soviet Caucasian mountaineering expedition (1958), and was involved in mountaineering expeditions in western Europe, the Middle East, Himalayas, Greenland, Russia, Greece and Poland. From its inception in 1956, he was director of the Duke of Edinburgh's award scheme and was created a life peer for services to youth on his retirement in 1966. He then became chairman of the Parole Board of England and Wales (1967-1974) and the National Association of Probation Officers (1974-1980) and championed penal reform. He became a Knight of the Garter in 1979. His publications include The Ascent of Everest (1953), Red Snows, Our Everest Adventure, In Search of Adventure, and his autobiography, Life is Meeting.